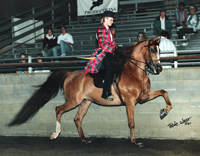 A rare Pask son, the elegant RM Kaypasa was Canadian National Champion Country Pleasure and a memorable Ladies Side Saddle horse, rare indeed with his brilliant and lofty trot in this difficult English division. He is now proudly owned by Dr. Tim Evans, formerly Equine Repo Vet for Ventura Farms. This entry was posted in Champions on October 15, 2013 by Anita Enander.